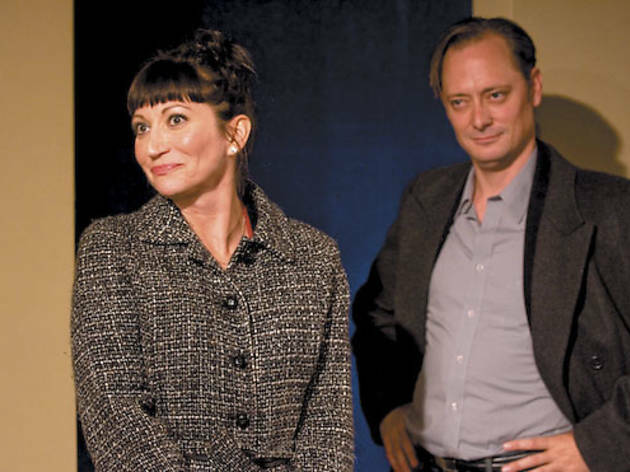 Though amusing in pieces, Gina Gionfriddo’s dark comedy doesn’t add up to much. Gina Gionfriddo’s cynical comedy is blazingly clever in pieces, but makes for a choppy, indistinct whole. Let your eyes go unfocused, like you’re staring at one of those trippy optical-illusion posters that were all the rage at shopping-mall kiosks in the ’90s, and you might sense the playwright’s aspirations to classical themes and literary allusions (the titular not-quite-heroine owes a little something to Thackeray’s Becky Sharp). Moment to moment, however, Becky Shaw is oddly paced, meandering, entertaining but confounding. The action centers—to use the term loosely—on a blind date gone incredibly wrong. 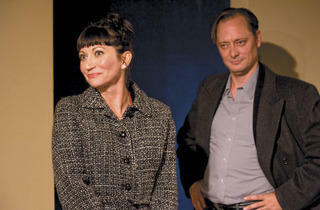 Neurotic Susanna (Jennifer Engstrom) and her granola-crunchy new husband, Andrew (Dan Granata), set up Susanna’s lifelong friend Max (Lance Baker, resembling James Spader’s haughtily sociopathic character on The Office) with Andrew’s temp coworker Becky (Mierka Girten), a wounded bird whose talons have a deceptively strong grip. The aftermath of their date, and the slow, sly reveal of everything that happened on that fateful night, make up the meat of the plot. Frustratingly, none of that comes about until after intermission. The long, languid opening scene takes place a year earlier, establishing both the sort-of-sibling relationship between Susanna and Max and the newly tightened financial straits of Susanna and her firebrand mother, Susan (the terrific Susan Monts-Bologna). For all the amusement of Gionfriddo’s zinging one-liners and the fully inhabited characterizations by the fine ensemble, few of their actions seem credible. Worse, it’s never clear in Damon Kiely’s production what, exactly, is the point.